"The name of Santa Rita really originated in New York. Some of the stock salesmen had encouraged a group of Catholic women to invest in the Group I certificates. These women became a little worried about the wisdom of their investment and consulted with their priest. He apparently was also somewhat skeptical and suggested that the women invoke the aid of Santa Rita, who was the patron saint of the impossible. As I was leaving New York on one of my subsequent trips to the field, two of these women handed me a sealed envelope and told me that the envelope contained a red rose that had been blessed by the priest in the name of the saint. The women asked me to take the rose back to Texas with me -- to climb to the top of the derrick and scatter the rose petals, which by then were dry, over the rig and to say 'I hereby christen thee Santa Rita'. I faithfully followed those instructions." From 1917 - 1919 more than 5000 oil and gas exploration permits were issued by the General Land Office for University Lands. No exploration was attempted until 1921. On August 23, 1921 (just four hours prior to the expiration of the applicable permit) the historic Santa Rita No. 1 was spudded in Section 2, Block 2, University Lands, Reagan County. Drilling continued for almost two years at the drill site, which was isolated by a shortage of adequate roads and limited transportation facilities. It has been said that the only sounds came from the rig, roadrunners, and rattlesnakes. Finally the historic day arrived on May 28, 1923, when a rattlesnake noise began at the well bore and changed to the sound of a wild prairie wind. Santa Rita came in with oil blowing over the top of the derrick and spraying the countryside. The first well drilled on University Lands, Santa Rita No. 1, was officially transformed into a bona fide oil well. The first oil royalty payment to the Permanent University Fund was made on August 24, 1923 in the amount of $516.53. 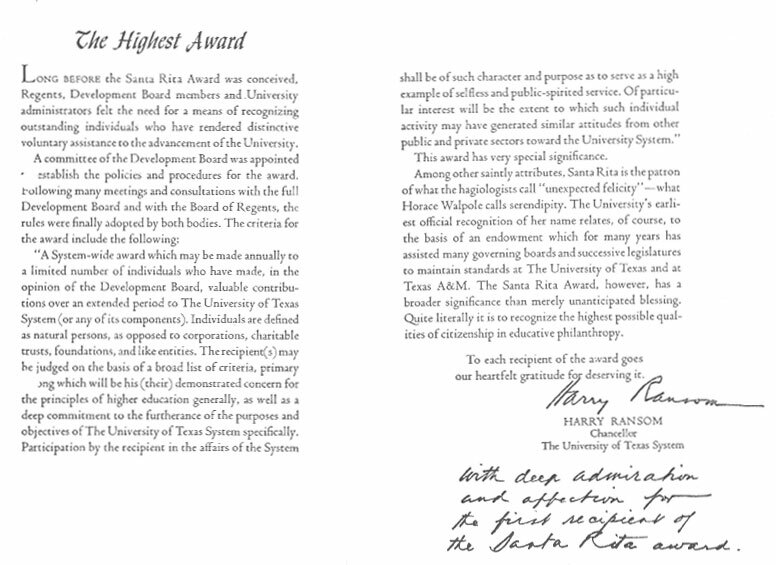 The Santa Rita Award is the highest award that is bestowed by the Board of Regents of The University of Texas System. Santa Rita, the discovery oil well whose resources transformed The University of Texas, was named after the patron saint of the impossible. The recipients of the Santa Rita Award have in their own way overcome the impossible as they furthered the transformation of The University of Texas as a University of the First Class. a demonstrated record of participation in the affairs of the System which serves as a high example of selfless and public-spirited service. Miss Ima Hogg received the first Santa Rita Award in 1968. The Award consists of a bronze medallion. The award was conceived and initially financed by Dr. H. F. Connally, Jr., as a major Systemwide award. Dr. Connally, of Waco, was responsible for having the medallion designed and he paid for the first medallions. Additionally, he was instrumental in assuring that the first copies of the book, Santa Rita--The Highest Award, were published. Lt. Governor William P. Hobby, Jr. The Honorable Dolph Briscoe, Jr. The Honorable William P. Clements, Jr.